Saint Helena (Latin: Flavia Iulia Helena Augusta), also known as Saint Helen, Helena Augusta or Helena of Constantinople (c. 250 – c. 330 C.E. ), was the consort of Emperor Constantius Chlorus, and the mother of Emperor Constantine the Great, with whom she had a close relationship. Helena played a significant role in re-establishing Christianity in the Holy Land after a period of decline. She allegedly rediscovered several Christian sites in the Holy Land, which had been converted to pagan temples, and she had these sites rededicated to Christianity. In particular, she is renowned for discovering the site of Calvary where she claimed to find the relics of the True Cross. She was canonized as a saint in both the Orthodox and Roman Catholic Churches, and is still venerated today. According to the sixth-century historian Procopius, Helena was born in Drepanum, in the province of Bithynia in Asia Minor, which was renamed the city "Helenopolis" after her death in 328 C.E. in her honor. Helena was probably born in 248 or 250 C.E. based on the statement made by the historian Eusebius of Caesarea who claims that she was around 80 years of age on her return from Palestine. Since that journey has been dated to 326–28 C.E., scholars have extrapolated her birthday. Fourth-century sources, following Eutropius' "Breviarium," record that she came from a low background. Saint Ambrose was the first to call her a stabularia, a term translated as "stable-maid" or "inn-keeper." He makes this fact a virtue, calling Helena a bona stabularia, a "good stable-maid". 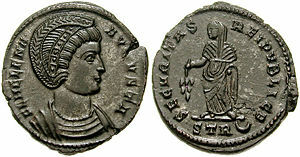 Other sources, especially those written after Constantine's proclamation as emperor, gloss over or ignore her background. It is unknown where she first met her future partner Constantius. Historian Timothy Barnes has suggested that Constantius, while serving under Emperor Aurelian, could have met her while stationed in Asia Minor for the campaign against Zenobia. Barnes calls attention to an epitaph at Nicomedia of one of Aurelian's protectors, which could indicate the emperor's presence in the Bithynian region soon after 270 C.E. The precise legal nature of the relationship between Helena and Constantius is unknown: the sources are equivocal on the point, sometimes calling Helena Constantius' "wife," and sometimes calling her his "concubine." Jerome, perhaps confused by the vague terminology of his own sources, manages to do both. Some scholars, such as the historian Jan Drijvers, assert that Constantius and Helena were joined in a common-law marriage, a cohabitation recognized in fact but not in law. Others, like Timothy Barnes, assert that Constantius and Helena were joined in an official marriage, on the grounds that the sources claiming an official marriage are more reliable. Helena gave birth to the future emperor Constantine I in 272 C.E. In 293 C.E., Constantius was ordered by emperor Diocletian to divorce her in order to qualify as Caesar of the Western Roman Empire, and he was married to the stepdaughter of Maximian, Theodora. Helena never remarried and lived in obscurity, though close to her only son, who had a deep regard and affection for her. Constantine was proclaimed Augustus of the Roman Empire in 306 C.E. by Constantius' troops after the latter had died, and following his elevation his mother was brought back to the public life and the imperial court, and received the title of Augusta in 325 C.E. Eusebius records the details of her pilgrimage to Palestine and other eastern provinces though not her discovery of the True Cross (See below). Helena died in 330 C.E. with her son at her side. 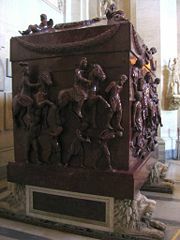 Her sarcophagus is on display in the Pio-Clementino Vatican Museum. During her life, she gave many presents to the poor, released prisoners and mingled with the ordinary worshippers in modest attire, exhibiting a true Christian spirit. She is considered by the Orthodox and Roman Catholic churches as a saint, famed for her piety. Her feast day as a saint of the Orthodox Christian Church is celebrated with her son on May 21, the "Feast of the Holy Great Sovereigns Constantine and Helen, Equal to the Apostles." Her feast day in the Roman Catholic Church falls on August 18. Her feast day in the Coptic Orthodox Church is on 9 Pashons. She is the patron saint of archaeologists. The names "Saint Eleanor" and "Saint Eleanora" are usually synonymous for Saint Helen. In 325 C.E., Helena was in charge of a journey to Jerusalem to gather Christian relics, by her son Emperor Constantine I, who had recently declared Rome as a Christian city. Jerusalem was still rebuilding from the destruction of Hadrian, a previous emperor, who had built a temple to Venus over the site of Jesus's tomb, near Calvary. According to legend, Helena entered the temple with Bishop Macarius, ordered the temple torn down and chose a site to begin excavating, which led to the recovery of three different crosses. Refused to be swayed by anything but solid proof, a woman from Jerusalem, who was already at the point of death from a certain disease, was brought; when the woman touched the first and second crosses, her condition did not change, but when she touched the third and final cross she suddenly recovered and Helena declared the cross with which the woman had been touched to be the True Cross. On the site of discovery, she built the Church of the Holy Sepulchre, while she continued building churches on every Holy site. She also allegedly found the nails of the crucifixion. To use their miraculous power to aid her son, Helena allegedly had one placed in Constantine's helmet, and another in the bridle of his horse. Helena left Jerusalem and the eastern provinces in 327 to return to Rome, bringing with her large parts of the True Cross and other relics, which were then stored in her palace's private chapel, where they can be still seen today. Her palace was later converted into the Santa Croce in Gerusalemme. According to the western Christian tradition, Helena acquired the Holy Tunic on her trip to Jerusalem and had it send to Trier. The robe is housed in the Cathedral of Trier and its existence has been well documented since the twelfth century. In Great Britain, later legend, mentioned by Henry of Huntingdon but made popular by Geoffrey of Monmouth, claimed that Helena was a daughter of the King of Britain, Cole of Camulodunum, who allied with Constantius to avoid more war between the Britons and Rome. Geoffrey further states that she was brought up in the manner of a queen, as she had no brothers to inherit the throne of Britain. Monmouth and Huntingdon's source may have been Sozomen. However, Sozomen does not claim Helena was British though he does claim in Historia Ecclesiastica that Helena's son, Constantine I, picked up his Christianity there. This legend may be confused with Saint Elen, wife of the later Emperor, Magnus Maximus. At least 25 holy wells currently exist in the United Kingdom that are dedicated to Saint Helen or Elen. She is also the patron saint of Colchester and Abingdon. Some have argued that Helena traveled to Nevern in Wales where she hid the True Cross. It is claimed to be hidden near the local Norman church of St Brynach, where a cross is carved into a rock formation. Named the Pilgrim's Cross, religious pilgrims once came here to pray for visions. Names of local places are abundant with cross imagery, including "River of the Empress," "Mountain of the Cross," "Pass of the Cross" and others. The alleged True Cross, however, has not been found in this region. Helena is the main character of Priestess of Avalon (2000), a fantasy novel by Marion Zimmer Bradley and Diana L. Paxson. She is given the name Eilan and depicted as a trained priestess of Avalon. Helena is also the protagonist of Evelyn Waugh's novel Helena. In the anime and manga, Hellsing, the Nail of Helena is a powerful artifact used by the Paladin Alexander Anderson to gain supernatural power. A Cathedral was named after her in Helena, Montana. ↑ Antonia Harbus. Helena of Britain in Medieval Legend. (Rochester, NY: D.S. Brewer, 2002. ISBN 978-0859916257) , 12. ↑ Eusebius, Vita Constantini 3.46. ↑ Ambrose, De obitu Theodosii 42; Harbus, 13. ↑ Samuel N. C. Lieu and Dominic Montserrat. From Constantine to Julian: Pagan and Byzantine Views. (New York: Routledge, 1996), 49. ↑ "Inscriptiones Latinae Selectae" 2775, cited in Timothy D. Barnes. The New Empire of Diocletian and Constantine. (Cambridge, MA: Harvard University Press, 1982. ISBN 978-0674611269), 36. ↑ Lieu and Montserrat, 49. ↑ Hieron., "Chron.," s.a. 292: 226, 4 and s.a. 306: 228, 23/4, cited in Lieu and Montserrat, 49. 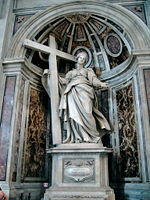 ↑ Jan Willem Drijvers, Helena Augusta: The Mother of Constantine the Great and her Finding of the True Cross. (Leiden & New York: Brill, 1997. ISBN 978-9004094352), 17–19. ↑ Adrian Gilbert. The Holy Kingdom: The Quest for the Real King Arthur. (Invisible Cities Press, 1998). Lieu, Samuel N. C., and Dominic Montserrat. From Constantine to Julian: Pagan and Byzantine Views. New York: Routledge, 1996. Mango, Cyril. "The Empress Helena, Helenopolis, Pylae," Travaux et Mémoires 12 (1994): 143–158. All links retrieved December 14, 2017. History of "Helena of Constantinople"
This page was last modified on 14 December 2017, at 15:44.